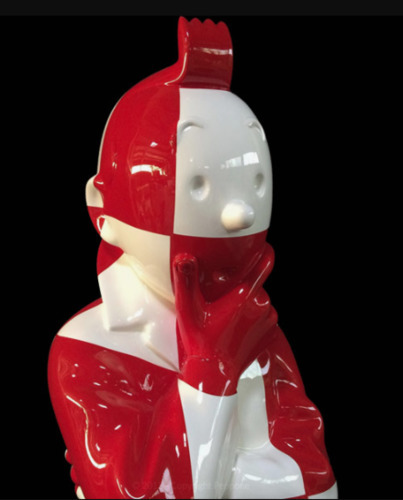 Christophe Tixier, also know as Peppone is a 45 years old artist living near Aix-en-Provence. Bulimic collector, he counts among his treasures about 500 albums of Tintin’s adventures, of which some have only few dusty pages left. He feeds his collection with what he finds in car boot sales, municipal libraries sales or even with what friends and strangers bring him. Thus from a place of dreams and travels, the adventures of Tintin are also a place of encounter for Peppone. But this treasure is mostly his Proust’s Madeleine since his first copies of Tintin came from his father when he died. The character of Tintin became a cornerstone in his balance that allowed him to cultivate his relation with his father and protect himself against a form of “artistic situation”. His Tintin has taken forms that he creates in his workshop by pruning his paper heritage. Sculpture in bronze - Original edition of 8ex. 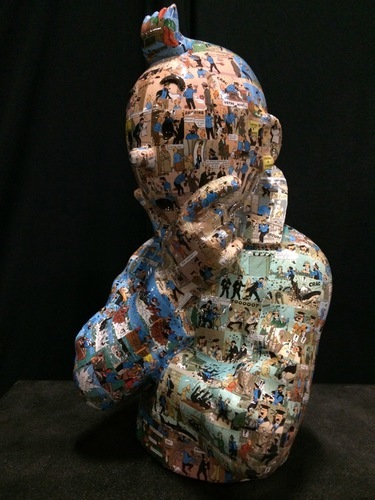 Resin and fiberglass sculpture, marouflaged comics - Original edition of 10ex.